St. Paul High School quarterback Paul Lopez confirmed he has recently accepted a scholarship to Division II Southwestern Oklahoma State University. The senior captain said the Bulldogs were impressed “with his work ethic” and decided to offer him a scholarship. 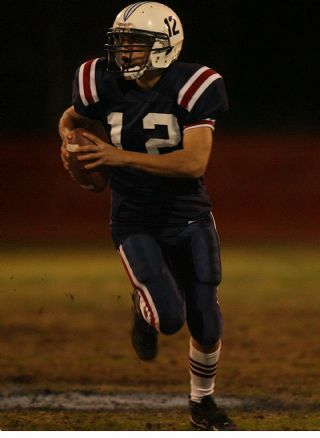 Lopez was the starting quarterback the last two seasons after earning the starter’s spot his sophomore year in which he guided St. Paul to a CIF-Southern Section Western Division title. Editor’s Note: There will be a full story in Thursday’s paper. Good luck Paul all your hard work is paying off. Good luck young man, hopefully we’ll hear and read articles on your progress. did they not see his stats? Chris Willson was and is a far more talented QB, he should of been the stater and than maybe we would of won more. The old guy just can’t pick the right talent for any positions. GOOD LUCK TO PAUL LOPEZ AT GETTING THE OPPORTUNITY TO COMPETE AT THE NEXT LEVEL. and to all the young athletes who are committed or still hoping to find a place to learn and play. Best Wishes. Willson is going to play baseball at Wake Forest and not Georgia Tech. Football was just a side thing for him. i agree Sp, Willson should of been the QB, he is the best athlete we have! but with our dinosaur coach who doesn’t have a clue didn’t give him a chance. Gtech Wake Forest, Who cares? The point was he needs to improve! Hello, That was a good blog post thank very much for sharing that info with me. So helpful and so useful post Lopez Heads East, well Southwest actually…. Thanks for such informative post. Good job. I enjoy the diversity of their strategy. The hand rendered form treatments are lovely. It might sound weird but my browser does notseem to be ready to d isplay your document rightly?- It looks like an entire chunk of if isn’t properly d isplayed as well as layout on the web page does notappear to become appropriate. Are you able to verify that th is publish continues to be set up for Opera?